UPDATE: Vintage Under Thirty now closed, thanks to everyone for shopping my vintage hoard! 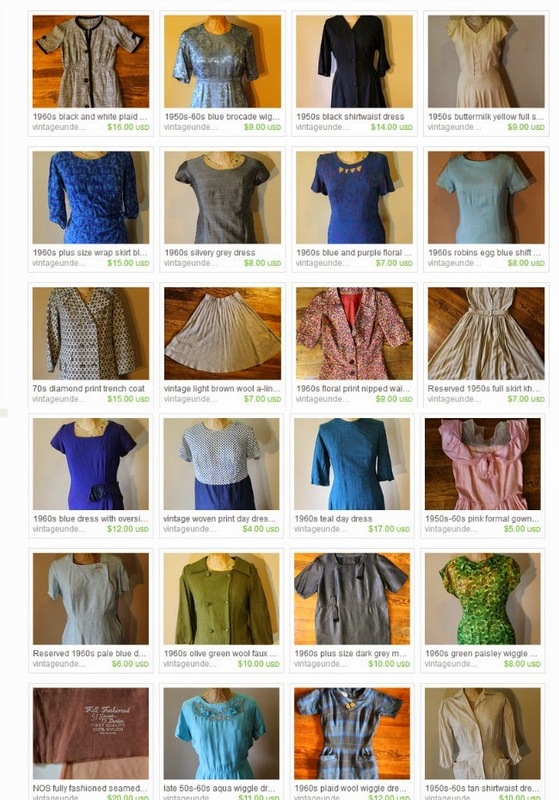 I'm so pleased to announce that I am 2/3 of the way done with listing my entire vintage hoard on etsy. I never thought that I'd be able to fly through this project so quickly but I am beyond thrilled that I did! As mentioned in my previous post, I bought several car loads of vintage clothes from a local warehouse a few years ago with the intention of running a full time etsy shop. My blog took off as my main business and I didn't have time for vintage repairs, cleaning and selling anymore. As life stands at the moment, I probably won't have extra time for any shenannegins like that until both kids are in school. So a huge area of my basement was full of racks and plastic totes full of clothes from the 1920s-1970s. It sat and I ignored it till spring cleaning took over this year and something had to be done. Instead of hanging on to yet another unfinished project, I decided to let it all go and I opened Vintage Under Thirty on etsy just two weeks ago! Since then, a large chunk of my hoard as found a new home and I'm finally down to listing the final 100 pieces of vintage!! When everything is gone, the space will become my new sewing room, since it's right next to the kids play room. 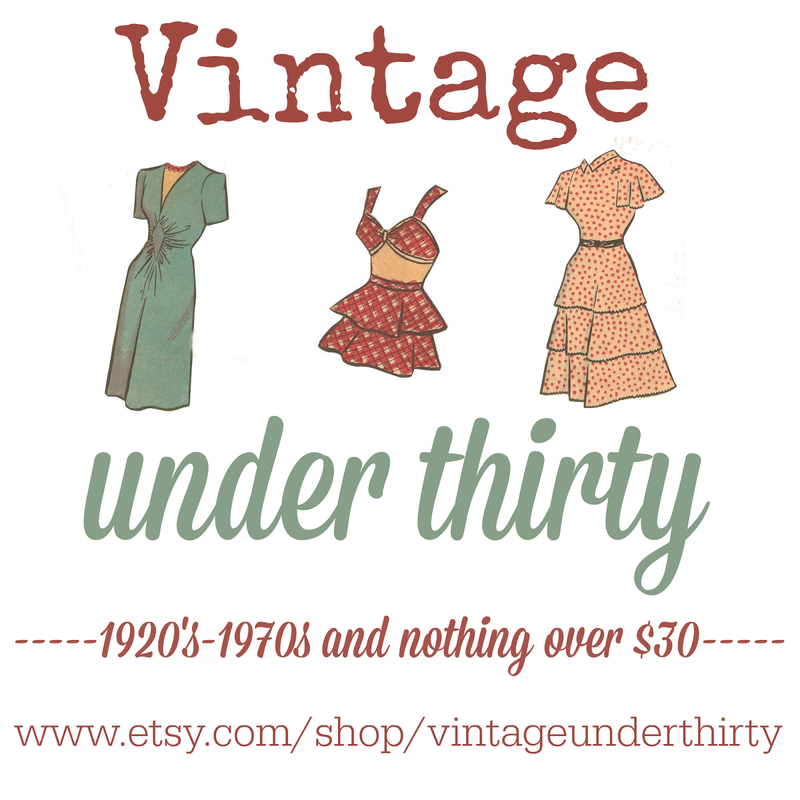 Please help spread the word and come check out Vintage Under Thirty on etsy where nothing is over $30! There's loads of dresses in all sizes, some great blazers and jackets, a few separates and lingerie items too. We do ship internationally and will combine shipping, just drop me a convo for rates. That's not the "royal we". Pj has been helping me with the shipping, packaging and all of that fun stuff! There will also be a big vintage coat sale very soon. Since coats are so heavy and shipping is expensive, all coats will be under $10. Some have lovely fur collars and jeweled buttons so stay tuned for those, coming this weekend into early next week. Items go super fast so I always update on Instagram (@vintageunderthrirty) and Facebook when listings will begin. Ugh, I so very wish I had some extra money to blow and all this good stuff! How fabulously exciting!!! My personal shopping budget is pretty much non-existent at the moment, but at those prices, even I could afford something (yay!). Thank you for listing such reasonably priced vintage goods, dear gal. Just got a couple of cute things, thanks!